Connects to a walking and biking trail. This campground, first and foremost, requires a National Park Pass, which is $20/week or $40/year, for 1 year from purchase date. Tent camping was $20/night. This campground was in a great location, lots of signage helps you find it and navigate the roads without use of GPS. Seriously, you don’t need one. At least from Empire, anyway. One thing to be cautious of is the poison ivy. It is everywhere. Two other notes on the side of caution, when my mom and I were hiking in the area we did see two ticks, and secondly, the campground is an active black bear area, so keep food and scents in your car. 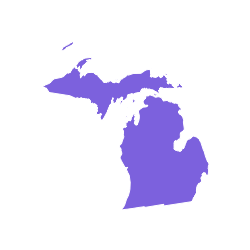 You will be located near Glen Arbor, Glen Haven, and Empire, and quite close to the Pierce Stocking Scenic Drive as well as the Sleeping Bear Dunes. The campground backs right up to the Heritage Trail, which is 20 paved miles to hike, bike, walk, ski, or whatever. Th campground, while quite packed, was still so so quiet at night, which was really nice. The tent pad is nice and level which really matters when it rains, like it did while we stayed. Firewood is available out of a mobile vending machine, and takes $5 bills. WiFi is available at the ranger station, I believe. Quiet campground with sites quite close to one another. This campground butts up to the heritage trail, which is 20 miles of hiking, biking, walking, or skiing fun. A short walk will get you to Lake Michigan and it’s sandy beach. Each site has a nice picnic table, a designated tent pad (if it’s a tent site) and a fire ring with a grill top. Firewood is available on site for $5/bundle, vault toilets are also available. No shower facilities. Lots and lots of poison ivy! Stay on the paths!! And tIcks! Stay in trails and out of tall grass or weeds. The tent pad is very compacted ground, definitely need a hammer or decent sized rock to pound in the tent stakes, and also definitely bring a sleeping pad or air mat. Tent sites are only $20/night, but you also need a National Park Pass, which is $20/1 week or $40/ 1 year, so be aware of that! Stayed at site 88, seemed to be a slightly more “roomy” site than others, as there were no neighbors behind us. PLUS thIs Is located very near to thw sleepIng bear dunes and natIonal lake shore! We stayed in the group sites. Got lucky with one off on its own. The other sites had no privacy. Right on the back side of a huge dune that you can climb. Right down the road from the official Dune Climb & Scenic Drive. This is one of my favorite campgrounds in Michigan. It is all walk ups so plan accordingly though the park service is might changing it to reservation. The sites are wooded and semi private. There are a few next to the beach. The Sleeping Bear Heritage Trail goes through the campground so bring your bicycles. Glen Arbor is near by with a good grocery, restaurants, and shopping.